Rock music, explicit video games or rap lyrics cannot explain away the evil in a man's heart. I know it's easier to say it's the object or the influence, but it's the heart of man that commits the actions. A Southern Poverty Law Center HATEWATCH blog post, titled "Canadians Hunt Gun Control-Hater in Cop-Killing Rampage", recently named the gun advocacy group Cold Dead Hands in an article relating to the rampage shooting in Moncton, a Canadian city located in Westmorland County in southeastern New Brunswick. While stating that his motives were "not immediately known" the article referenced "a series of anti-police and anti-gun control references on his Facebook page" and referred to a particular post from the Cold Dead Hands Facebook page by name. The feisty gun advocates shared the implied "blame" with some other big names as well, including heavy metal icons Megadeth, Jacob Rothschild and Shindler's List. In a blog post of their own, Cold Dead Hands took issue with the implications and responded, "Southern Poverty Law Misfires". In their rebuttal post they stated, "We want to make it perfectly clear that we will not stand for such insinuations. While our name may be harsh sounding to some, it represents our resolve in our advocacy, but our message is clear. We do not, nor will we ever, advocate armed insurrection..." The response went on to say, "Our position, which has been clearly stated repeatedly, is that change must come through the tools put in place by our Founders and as Patriots the only justifiable use of force is in defense against violent unlawful aggression. We regularly work too quell the revolutionary passions that some of our followers express and ban those who will not listen to reason." The Southern Poverty Law Center is no stranger to controversy, having been in the News in the past following questionable assertions. They made headlines when they named the Family Research Council a "hate group" which sparked much debate. 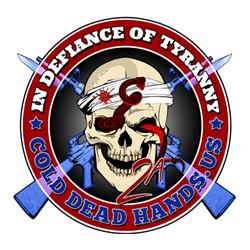 While Cold Dead Hands is a relatively small grassroots organization, they are growing rapidly and not afraid to take on the big boys. In their response, they literally shamed Southern Poverty Law Center saying, "In closing, I will simply say to Southern Poverty Law Center, Shame on you for such reckless association, lazy reporting and failure to even do minimal research. It is a slap in the face to those who have been hurt by this rampage for you to make such careless inferences." The response was written by Jon Britton, who is a regular contributor to their blog and also listed as the Chief Operating Officer for the group's parent company, CDH, Inc.
Patrick James, CEO of CDH, Inc. and founder of the Cold Dead Hands Advocacy Group had this to say, "Rock music, explicit video games or rap lyrics cannot explain away the evil in a man's heart. I know it's easier to say it's the object or the influence, but it's the heart of man that commits the actions. I wish I could I say I expect more from the Southern Poverty Law Center, but you can't make a silk purse out of a sow's ear."